CLEMONS, IA, March 7, 2012, Allen E. Brennecke, Attorney at Law (Retired) with Moore, McKibben, Goodman & Lorenz, LLP, has been recognized by Elite American Lawyers for dedication, achievements, and leadership in legal education and consulting. Over the course of a career that has spanned 50 years, Mr. Brennecke has refined a time-honored craft of practicing law. As a retired attorney, he now ensures that skillful professionals enter into the field by helping individuals seeking to experience growth as legal professionals receive the training they deserve. Mr. Brennecke currently speaks to lawyers at continuing legal education meetings, and lectures at business meetings for farmers and farm owners. Mr. Brennecke pinpoints major career highlights as his being honored as president of the Iowa State Bar Association, an organization that also granted him an Award of Merit in 1989, and being named chair of the House of Delegates of the American Bar Association. He attributes his success to being blessed with a wonderful wife, five children and their spouses, 18 grandchildren, one great-grandchild, good friends, and blessings from the Lord. 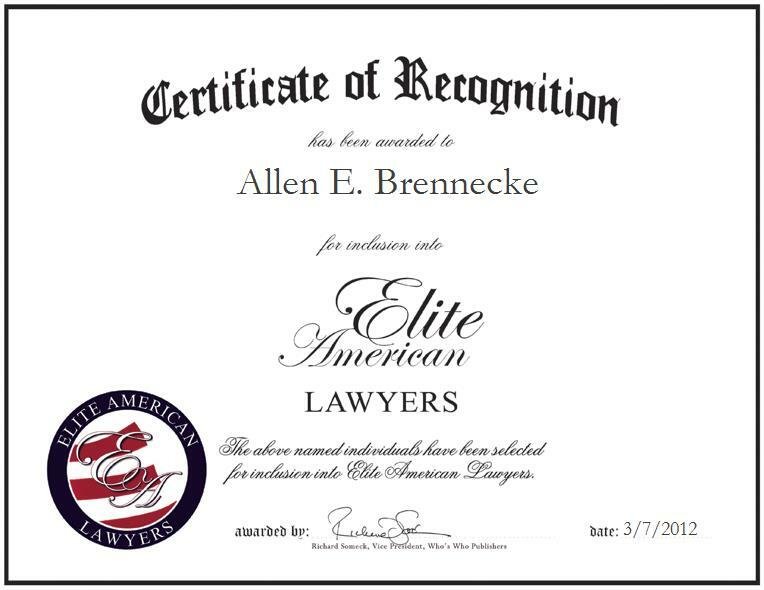 Allen E. Brennecke was originally selected for inclusion in EliteAMERICAN Lawyers in March 2012. We are proud to be featuring Mr. Brennecke again in EliteAMERICAN Lawyers for 2013/2014.